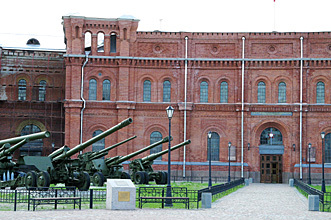 Displaying an enormous collection of arms and heavy artillery from the Middle Ages to the present day, this museum is located just across a narrow canal from the Peter and Paul Fortress. The museum is a great place to visit with your kids, who will love the open-air exhibition of artillery and missile launchers in the museum's courtyard. Inside the museum displays a rather old-fashioned collection of military memorabilia, temporary exhibitions, a nice little shop stocked with models of weapons and miniature soldiers and a cafe. How to get there? Take the metro to Gorkovskaya Station, turn right and walk through the park towards the Peter and Paul Fortress. When you reach the canal turn right and the museum is just a little further on your right-hand side.